Halloween is still more than 3 weeks away, but the Madtini Intoxicology Labs crew are on the lookout for the most delicious cocktail treats that we can find between now and then. As soon as we saw the Caramel Apple Martini posted on Marla’s Austin Chronicles we knew we wouldn’t be waiting til Halloween and that we had to try it immediately. Soon, the sugar was melting on the stove and Madtini Labs were filled with the sweet smell of caramel. 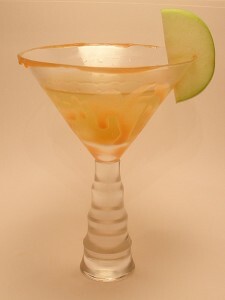 Dribble caramel sauce on the inside of a martini glass, then coat the rim by turning the glass in a shallow dish of caramel. Immediately put the martini glass into the freezer to chill. Combine the apple liqueur, butterscotch schnapps and vanilla vodka in a cocktail shaker half-filled with ice. Shake, then strain into the chilled cocktail glass. In a thick bottomed saucepan stir and melt sugar until it begins to turn amber. Add the butter and whisk until it in blended into the sugar. Remove from heat, then add the whipping cream. Let cool, then store in a glass container for up to 2 weeks. Hey, thanks for the shout-out! I gotta admit, your recipe seems much more delish than mine, and mine is pretty delish, so… YUM! Thanks for posting yours, we’ll have other tasty cocktail treats online for Halloween soon. Cheers!